Copyright 2011 Springer Science+Business Media B.V. Private property is increasingly important for nature conservation, and exurbia an increasingly prominent form of private land use. There have been very few studies of the attitudes of exurban landowners to nature, all of which indicate a high degree of biophilia, and no studies of the effect of variation in the attitudes and actions of these landowners on wild mammal assemblages on their properties. 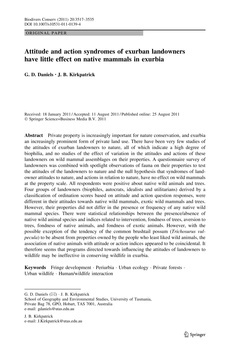 A questionnaire survey of landowners was combined with spotlight observations of fauna on their properties to test the attitudes of the landowners to nature and the null hypothesis that syndromes of landowner attitudes to nature, and actions in relation to nature, have no effect on wild mammals at the property scale. All respondents were positive about native wild animals and trees. Four groups of landowners (biophiles, autocrats, idealists and utilitarians) derived by a classification of ordination scores based on attitude and action question responses, were different in their attitudes towards native wild mammals, exotic wild mammals and trees. However, their properties did not differ in the presence or frequency of any native wild mammal species. There were statistical relationships between the presence/absence of native wild animal species and indices related to intervention, fondness of trees, aversion to trees, fondness of native animals, and fondness of exotic animals. However, with the possible exception of the tendency of the common brushtail possum (Trichosurus vulpecula) to be absent from properties owned by the people who least liked wild animals, the association of native animals with attitude or action indices appeared to be coincidental. It therefore seems that programs directed towards influencing the attitudes of landowners to wildlife may be ineffective in conserving wildlife in exurbia.